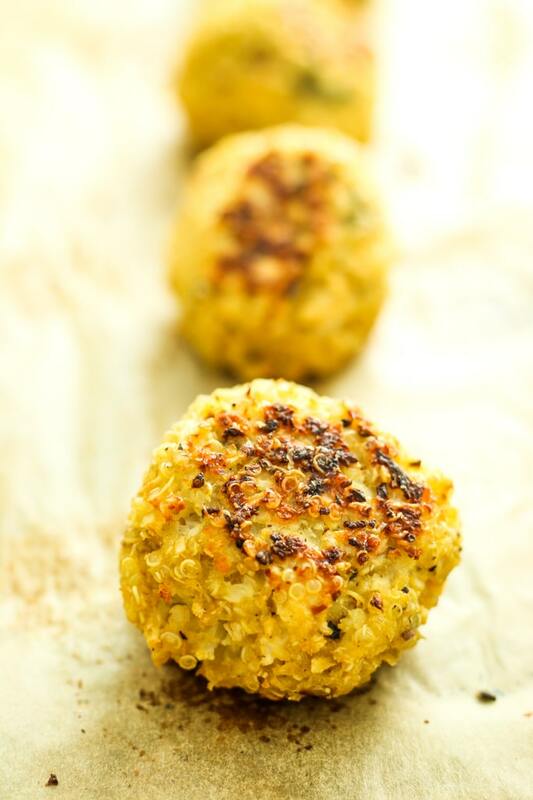 This herbed cauliflower quinoa meatball recipe is a protein-packed vegetarian alternative. 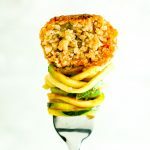 It combines riced cauliflower and quinoa with garlic and herbs for a savory, tender meatball that’s perfect with pasta or veggie noodles! Meatballs! Without meat. With cauliflower and quinoa instead! Wait, what? Are they still considered meatballs? I don’t know. And I don’t really care, either. Because they’re GOOD and that’s all that matters. See? The possibilities are endless. 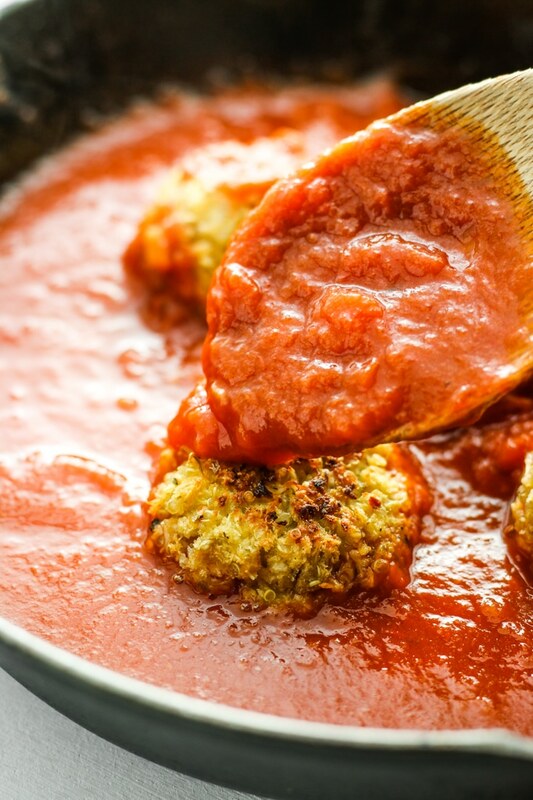 These vegetarian meatballs are the little engine that could. 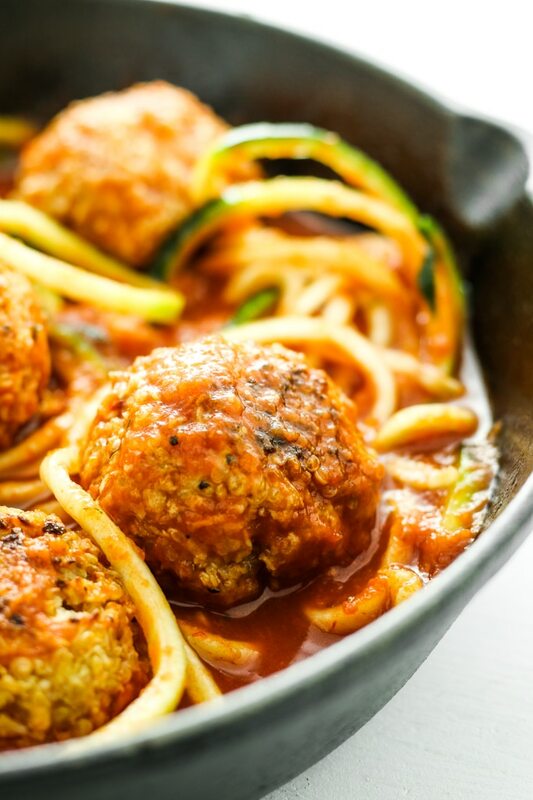 I’m especially loving them with zucchini noodles and my favorite spicy red pasta sauce (I’m digging DeLallo’s spicy arrabbiata right now, because I caught it on sale obviously). I love that I’m getting a serving of plant-based goodness and I feel SO full afterwards. Something else that I feel must be mentioned. I have been known to grab a few of these directly out of the fridge and dip them in aforementioned spicy pasta sauce. Is that weird? Maybe. Oh well.  No shame in my game. 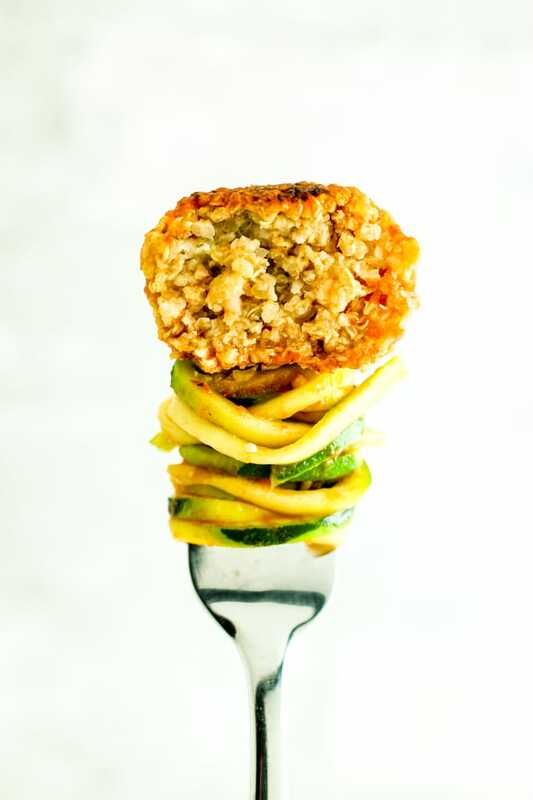 These vegetarian meatballs are another recipe option that keeps those 2018 healthy eating goals on track WITHOUT being boring or leaving us hungry. There’s plenty of protein, plenty of fiber, and plenty of flavor. No meat necessary.  Sauce ’em up. Serve, and enjoy! Sounds delicious!! Can Panko be substituted for regular bread crumbs? I’m not a big fan of thyme, so I replaced it with oregano and basil. Loved them! Thanks! Awesome – I’m glad you enjoyed! Soooo, I tried making these and it was a bust. I followed the recipe and for some reason the mixture would not form balls. I tried adding more quinoa and then breadcrumbs to get it to form balls but it never worked out. Any sugestions? Hi Tori! I’m sorry to hear this recipe didn’t work out. I wish I could give you a definite reason but it’s hard to say without being there! Did they turn out too dry or too wet? You left the cauliflower raw, correct? Made a double batch of these this week. I balled the 2nd part of the batch. i was going to freeze them for backing later. My wife loved them so much she asked me to go ahead and bake the whole thing. She had a road trip in her future and wanted to take them for savory snacks. We both enjoyed them very much. Thanks for the recipe. I’m so glad you and your wife like these! I agree – they’re perfect for savory snacks, too! Can this be made with out eggs? Yes! You can substitute flax eggs for the egg. Do you cook/steam the cauliflower before mixing? No ma’am! Just riced cauliflower, uncooked.